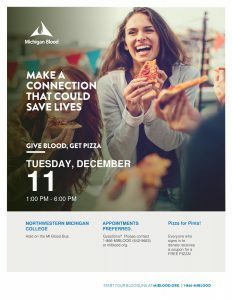 December 11, between 1- 6 pm, the Michigan Blood Drive bus will be taking blood donations in the parking lot. The bus will be located in between the power house and the library. Everyone who signs in to donate receives a coupon for a FREE pizza!